Today is Food Revolution Day, so named by Jamie Oliver in his crusade to increase awareness about our food systems, globally, and to inspire children (and adults) to take charge of what they eat, starting with a simple revolutionary act: Learning to Cook! In support of this year’s Food Revolution Day theme “Feed the Future”, Jamie has created a set of 10 essential recipes that cover a wide range of cooking techniques to set any cook up for making some delicious meals and then serve as a springboard for variations as the cook’s confidence increases. My cyber-friends who have been cooking together since 2010, first with French Fridays with Dorie and now under the umbrella of Cook the Book Fridays, are joining forces today to make what we consider to be an essential French recipe from our current project book My Paris Kitchen by David Lebovitz. Can you guess what that recipe might be? Quiche! I’ve been making quiche since early in my savory cooking career. 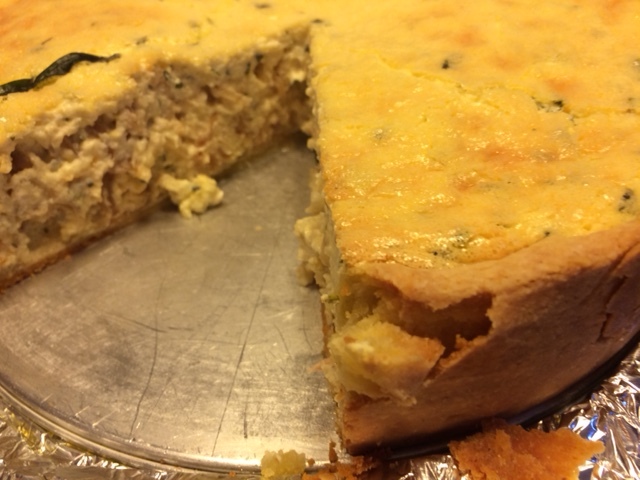 When I look back in my first recipe card file book (which has served as a chronological history of my favorite things to cook from age 12 through college), it appears that I added quiche to my repertoire in the summer after my freshman year of college. I aimed high. My first favorite version was Julia Child’s Spinach Quiche (Quiche aux Épinards) from Mastering the Art of French Cooking. I doubt I made my own crust at the start, but I made spinach quiche over and over again. 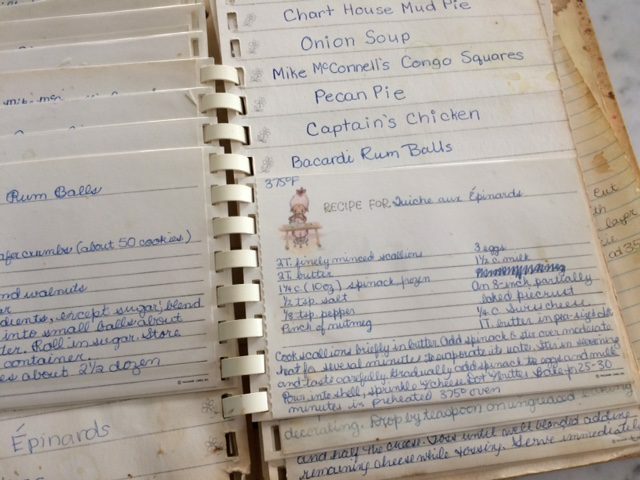 In fact, I still make this particular recipe from time to time. Now I think of quiche as more of a formula than a recipe. I mix-and-match crusts, custards, and fillings depending on the season and what’s in the fridge. It’s a wonderful way to use up leftover cooked vegetables and other side dishes. Bind them with a custard and you have a filling lunch or dinner. In honor of Food Revolution Day, we are making David Lebovitz’s version of quiche from My Paris Kitchen: Tarte Salée au Jambon, au Bleu, et aux Poires (ham, blue cheese, and pear quiche). The recipe starts with a sturdy crust made with standard ingredients (flour, butter, salt) plus cornmeal and egg. I usually make my pâte brisée in the food processor, but this crust mixed up easily in a stand mixer. I liked that the crust didn’t require pre-baking, though it wasn’t as flaky as the other crusts I use for quiche. The custard was INCREDIBLY rich. My usual formula combines eggs and milk (sometimes skim). David’s recipe combined cream cheese and heavy cream with a combination of whole eggs and egg yolks. Wow was it decadent! Once baked it had a silky texture and practically melted in your mouth. This rich custard isn’t something I could justify indulging in every week, but I would pull it out for special occasions. As for the filling, sautéed shallots, diced ham, crumbled blue cheese, diced pear, and a generous amount of minced tarragon (fresh from my garden) added substance to the mix. Any of you familiar with my husband Howard’s rules about when he’ll eat fruit might wonder how I handled this recipe. David said the pear flavor wasn’t strong, but if noticed, I didn’t want Howard to have to come up an alternate meal on the fly. Aren’t I nice? I combined all the ingredients except the pear and added them to the pan. Then I marked halves of the quiche with tarragon leaves and gently stirred the diced pear into one half of the quiche. His and hers! This deep-dish quiche is a keeper. As I mentioned, the custard isn’t for every day, though I might take inspiration from the ham and cheese combination to add to a lighter custard. For anyone trying to round out their culinary skills to feed themselves in the future, quiche is a “must know” kind of recipe. This recipe is a really good version to start with. The crust is manageable, even for a beginner, and the end result is a hearty and delicious meal. 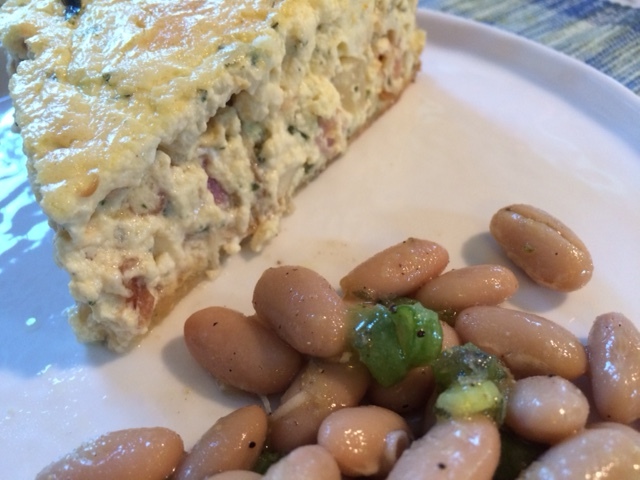 I served slices of quiche with a white bean salad on the side. A green salad would also be a good accompaniment. The vinaigrette on the salad will help cut the richness of the quiche. If you want to take your quiches to the next level, try this recipe on page 155 of My Paris Kitchen. 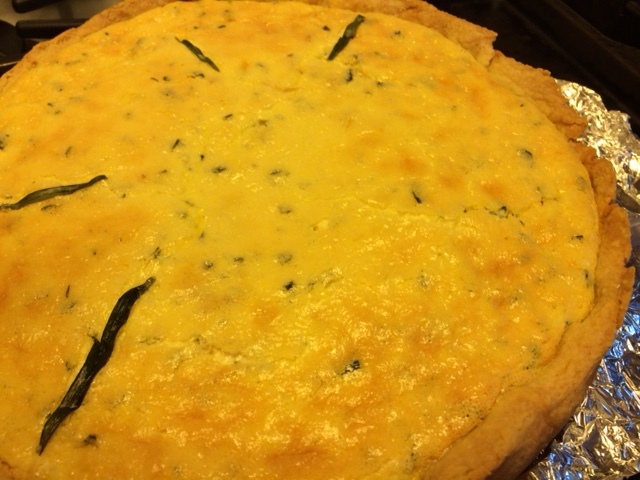 To find out more about my friends’ quiches, check out their links here. Now that we’re cooking through David Lebovitz’s My Paris Kitchen, I’m discovering new twists on familiar and new recipes. Take this week’s choice, for example. Chocolate Mousse is something that I always forget about. I’ve made it a few times before, and it’s always a crowd pleaser. However, it’s not something that comes to mind when I’m deciding what to make for dessert. Discovering this week’s recipe Salted Butter Caramel-Chocolate Mousse takes things over the top. The name says it all. It’s not just chocolate mousse. It’s chocolate mousse that starts with a salted caramel. I used to be terrified of molten sugar, but the more I make it, the more comfortable I get. Melt sugar, whisk in butter and cream, and you’ve got caramel. 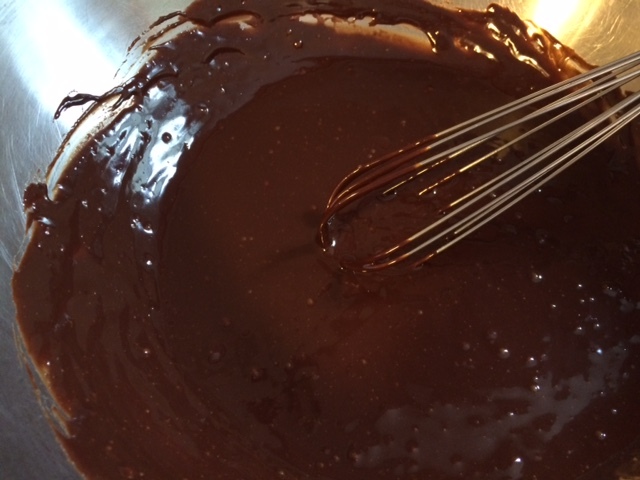 Stir in chopped dark chocolate until it melts and you have chocolate caramel. Once it cools to room temperature (we don’t want scrambled eggs in our caramel, do we? ), you whisk in egg yolks. Finally, fold in stiff egg whites with some fleur de sel, and you have salted butter caramel-chocolate mousse. Spoon the mousse into glasses. Voilà! Who would think that something so good would be relatively easy to make? The hard part is waiting at least 8 hours for it to chill. The mousse is packed with flavor. Both the chocolate and the caramel flavors come through. It’s sweet, but not too sweet. It’s light, so not too filling a dessert. The small juice glasses I used are the perfect size for a little treat after dinner. So far Cook the Book Fridays’ new book choice hasn’t disappointed. 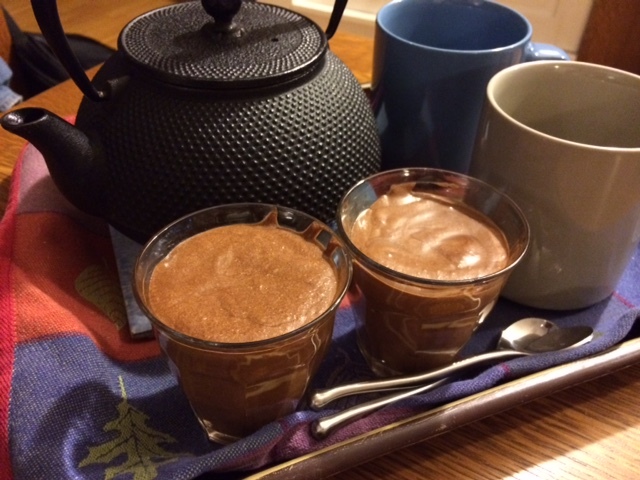 I will have to remember to serve this mousse to company so it’s deliciousness can be shared. If you want to try it at home, you can find the recipe on page 258 of My Paris Kitchen. The recipe has also been published on Epicurious. 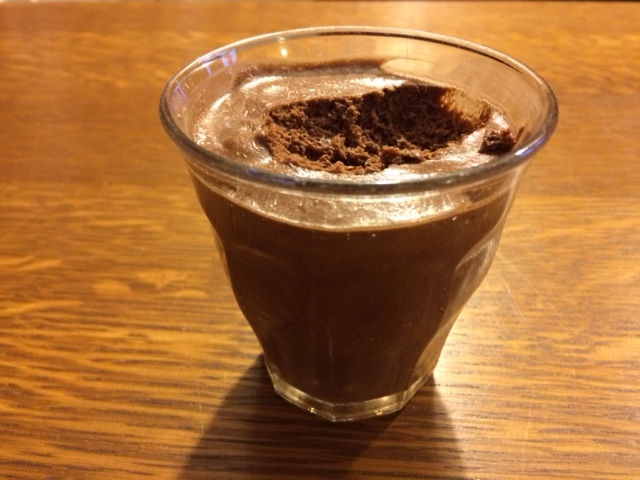 To see what my friends thought of the mousse, check their links here. The core of Cook the Book Fridays are bloggers who met through French Fridays with Dorie, have remained friends, and enjoy cooking together (virtually anyway). All are welcome to join us as we continue the journey through another French cookbook, David Lebovitz’s My Paris Kitchen.